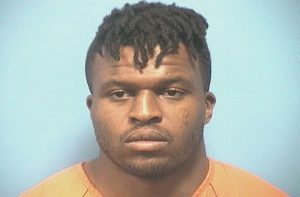 SHELBY COUNTY — A reverse prostitution sting netted 13 men on Wednesday, one of whom is listed as a player for the Birmingham Iron. Lawrence Okoye is on the official Birmingham Iron roster, where he is listed as a 6-foot-6-inch, 350 pound defensive tackle. Okoye is from England, where he was a track and field star, Olympian and holds the country’s record for the discus throw. According to law enforcement, the undercover sting was conducted by the Shelby County Drug Law Enforcement Task Force and was in partnership with the Hoover Police Department. The operation was carried out in north Shelby County. Officials said that the operation is a continuation from Sept. 20 and Oct. 18 of last year, in which 20 total offenders were previously arrested. This undercover reverse prostitution sting has been titled Operation Close Out, with the latest iteration being Round 3.